From the Star Wars Rogue One collection by Robe Factory. 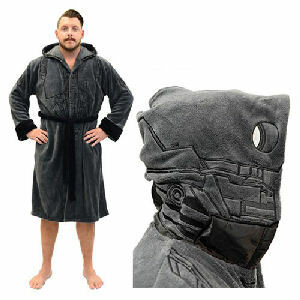 Star Wars Rogue One K-2SO Hooded Fleece Bathrobe. From the Star Wars Rogue One collection by Robe Factory. Star Wars Rogue One K-2SO Hooded Fleece Bathrobe. The robe measures approximately 46 inches long and has 30 inch sleeves. One size fits most. Made of 100% polyester fleece. Machine washable.